Most of you already understand the Entrepreneur and the Manager; The Technician is the trade that you have; for example you are a Baker who decides to open a Bakery – the technician in you knows everything about being a baker and has years of experience in it. The equivalent in Real Estate is an agent who goes on to open a Real Estate Brokerage. 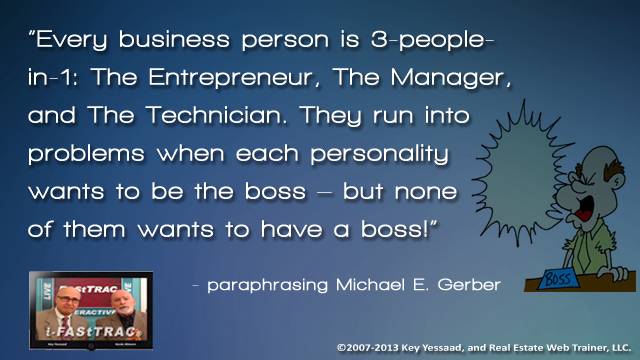 Michael shares this nugget of truth: Every person who goes into business for themselves is actually three-people-in-one: The Entrepreneur, The Manager, and the Technician. The Problem of running the business becomes compounded when each personality wants to be the boss – but none of them wants to have a boss! Ponder that thought.